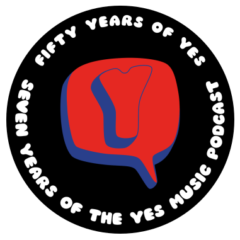 The twenty-fifth episode of the Yes Music Podcast featuring my thoughts on why I listen to Yes. Did you have a personal introduction to the music of Yes? Can you define what made you into a Yes fanatic? Why do you listen to Yes music? Hello Kevin Great show as always wow pretty neat the age that you started to listen to Yes. When I was growing up in the late 60’s and early 70’s I was living in what is known as the “Motor City” so Motown was huge. Until one day when my buddy who lived just down the street from me had this album with these guys sitting around on the cover and he played me a track from this album and I think it was a venture now you have to remember that all I had at the time was a transistor radio that was am only and all they ever played was Motown not that it was bad but Yes music was night and day compared to Motown.I think I was eleven so I’m guessing it was 1971 or early 72 then it was “Yours is no disgrace” that was it there was no turning back for me all my friends were like who are these guys oh they are not as good as Led Zeppelin I would get into huge arguments over my band I was that devoted to the band so it came to the point that I would only hang around with my buddies who liked prog rock.My Father was a musician trained on all things key board and I was open to a wide type of music early on before I listen to yes i remember asking my Mom and Dad if I could have for Christmas the “Blood sweat and Tears” album along with the new Chicago Trans authority album that was 1969 God I miss Vinyl albums some times.Sorry I have kinda went off again.I will never forget my Father asking me who that guy was that was playing keyboards for Yes I told him that it was Rick Wakeman and he said wow that he had never heard anybody play like that at all and I was just like yes I know. Okay that’s enough rambling. Thank you very much for alll your hard work that you put into your show it brings back so many great memories for me I can’t even begin to tell yo. Hi Paul and thanks so much once again for your comment. Your story is also really cool – I can’t imagine what it must have been like to discover Yes at that time! As I said int he episode – we all seem to have our own, amazing tale to tell about how we were first introduced to the band – maybe that’s why we are still so passionate! The main reason I listen to Yes is the music. It transcends space and time and takes you on a journey. No matter what lineup, each album has something magical to offer and I love visiting Yes Heaven (which I am sure looks like a Roger Dean painting) very often. Another reason, and I am sure many will agree with me, is the drama that ensues the Yes camp. The squabbles, the tensions, the shock and awe of which lineup will come next. It sure makes for great fodder on sites like yours and it beats any soap opera I have ever seen! I have the 9012Live podcast uploaded on my iPod which I will listen to at work tomorrow, I can’t wait! Thanks once again, Scott. I couldn’t agree more. I hope you are enjoying the current soap opera – I wonder how Jon Davison will get on? ….one more reason if I may is the plethora of offshot bands and solo albums that have come from the Yes camp. Thanks for the link, Scott – yes, the offshoots are great and I must find out more about them all! White sounds good! Longtime (longer than I may care to admit!) Yes fan, going back to the mid-seventies. I first caught on to your podcast last year around the holidays and have been thoroughly enjoying it since. Up until recently I was pretty locked into the “Classic Yes” (Yes Album through Going for the One) era, and paid little attention to earlier and subsequent albums. Your podcast has turned me on to the great stuff on Keys to Ascension, made me take a fresh look at Tormato, reminded me how completely awesome Yes’ cover version of Paul Simon’s “America” is, and more. Thank you! 1. Steve Howe is the most complete and the most interesting guitarist in rock history. That is not at all hype or overstatement. There is so much to say about this guy’s playing, he plays EVERYTHING really well, but I’ll just bring up the thing that I dig the most: I LOVE how Steve drops crazy rockabilly licks and pedal steel into songs as a way to spice up that tasty neoclassical stew the other guys are cooking up. Unexpected, and brilliant. And, oh yeah, the other guys are pretty amazing musicians too! 2. Great memories. As a high schooler and college student growing up in Southern California, my musician friends and I were something of a Yes cult! The band came through SoCal numerous times in the mid and late seventies, and I caught every show. Great times with good friends, and the music was wonderful. 3. On the iPod, while I ride my bike, Yes is the best accompaniment. I live adjacent to the American River Bike Trail in Sacramento, and gliding along the riverside, through the trees and under bridges, Yes is my soundtrack. 4. Inspiration. When I feel low, or worried, I put on one of my favorites like “Awaken” or “And You and I” or “Revealing Science of God” and I get my life-batteries recharged. I can’t describe it any other way. 5. Yes fans. Always great to run into one. I have met many through the years. Intelligent, funny and passionate about music, all kinds of music. Good folks who love a great band. Sorry about the long post, but I have been meaning to correspond for some time now, got a lot to say! Thanks for the dedication and great work! Hi Richard – it’s fantastic to have you along for the ride! Thanks so much for the comment. I’m glad I have managed to encourage you to listen to an extended range of Yes music – that’s part of the point of the podcast! I’m very jealous that you were able to be present at some key moments of Yes history. I agree that Steve Howe is part of the reason that Yes sounds nothing like any other band – as you say, it’s the unique combination of seemingly crazy ingredients which add the special Yes spice. I was speaking via Twitter to a fellow Yes fan recently who is intending to take her iPod with her when she visits Yes Tor in Devon. Perhaps, like your bike riding, everyone should take this inspirational music with them to an outdoor venue and report back on the experience! Finally, I couldn’t agree more with your assessment of Yes fans – as you can hear on the various episodes where I get the opportunity to talk directly to ‘intelligent, funny and passionate’ people like you. As I’ve said many times before, that’s what makes the podcast worth doing.